by Chris Woodford. Last updated: July 5, 2018. Is there anything worse than wires? If you've ever hooked up a computer and half a dozen peripherals (add-ons), a digital television and a DVD player, or run your own telephone extensions through the house, you'll know just what a pain all those cables can be. Wouldn't it be nice if there were a way of bringing electronic gadgets together so they could share whatever signals they need without any wires at all? Enter Bluetooth! It's a simple way for cellphones, printers, PCs, digital cameras, and other gadgets to link together over relatively short distances using wireless (radio wave) technology. The curious name comes from Harald Bluetooth, a Danish king who united the Scandinavians in the 10th century. Will Bluetooth unite the electronic world the same way? Let's take a closer look! Photo: Bluetooth in a nutshell: it's superb for connecting small devices to other devices nearby, avoiding the need for clumsy and dangerous wires. So you could use it to link a laptop to a wireless mouse or tablet, perhaps, or to hook up your headphones to either without the need for an irritating length of droopy wire getting in the way! Photo: Cables can be a real nuisance—that's the problem wireless technologies such as Bluetooth can help to solve. We're all use to wireless communication by now, even if we don't always realize it. Radio receivers and television sets pick up programs beamed in radio waves hundreds (possibly even thousands) of km/miles through the air. Cordless telephones use similar technologies to carry calls from a handset to a base station somewhere in your home. If you use Wi-Fi (wireless Internet), your computer sends and receives a steady stream of Internet data to and from a router that's probably wired directly to the Net. All these technologies involve sending information back and forth not along copper cables but in radio waves buzzing invisibly through the air. Bluetooth is a similar radio-wave technology, but it's mainly designed for communicating over short distances less than about 10m or 30ft. Typically, you might use it to download photos from a digital camera to a PC, to hook up a wireless mouse to a laptop, to link a hands-free headset to your cellphone so you can talk and drive safely at the same time, and so on. Electronic gadgets that work this way have built-in radio antennas (transmitters and receivers) so they can simultaneously send and receive wireless signals to other Bluetooth gadgets. Older gadgets can be converted to work with Bluetooth using plug-in adapters (in the form of USB sticks, PCMCIA laptop cards, and so on). The power of the transmitter governs the range over which a Bluetooth device can operate and, generally, devices are said to fall into one of three classes: class 1 are the most powerful and can operate up to 100m (330ft), class 2 (the most common kind) operate up to 10m (33ft), and class 3 are the least powerful and don't go much beyond 1m (3.3ft). Photo: Connecting with Bluetooth is simplicity itself. Simply enable Bluetooth on both devices, put them reasonably near one another, and they'll recognize one another and make a "pairing request." Select "pair" on each device and they connect. The devices can be completely different things: here I'm pairing an LG smartphone (left) with an Apple iPod Touch (right). Bluetooth devices automatically detect and connect to one another and up to eight of them can communicate at any one time. They don't interfere with one another because each pair of devices uses a different one of the 79 available channels. If two devices want to talk, they pick a channel randomly and, if that's already taken, randomly switch to one of the others (a technique known as spread-spectrum frequency hopping). To minimize the risks of interference from other electrical appliances (and also to improve security), pairs of devices constantly shift the frequency they're using—thousands of times a second. When a group of two or more Bluetooth devices are sharing information together, they form a kind of ad-hoc, mini computer network called a piconet. Other devices can join or leave an existing piconet at any time. One device (known as the master) acts as the overall controller of the network, while the others (known as slaves) obey its instructions. Two or more separate piconets can also join up and share information forming what's called a scatternet. Photo: Spread-spectrum was designed for use in wartime to stop jamming of radio signals between warships and the torpedoes they fired. 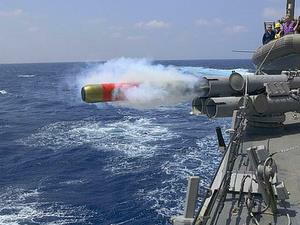 Photo by John L. Beeman courtesy of US Navy. Suppose you're talking to a friend on a walkie-talkie or with a CB (citizen's band) radio, but there are other people using the same frequency and your conversation keeps getting interrupted. What can you do? Most experienced radio users know the answer: you both change to a different frequency (band) and resume your conversation there. And you can keep on switching band until you find a place where you can happily talk without interruption. In theory, you could use the same technique for covert communication: if you were talking over the radio and someone was eavesdropping, you could give a code-word to your friend and hastily switch to another, pre-arranged frequency band where the eavesdropper wouldn't find you (although they'd most likely still pick up your signal sooner or later). Radios are clever electronic gadgets, so why can't they do this neat trick for themselves? Why can't they simply switch to another frequency automatically to prevent interference and eavesdropping? This is the basic idea behind a technique called spread-spectrum frequency hopping, where signals are rapidly and randomly switched across a wide range of different frequencies to improve the security and reliability of wireless communication. Numerous inventors contributed to the invention of spread-spectrum, including electricity pioneer Nikola Tesla (1856–1943) and US actress Hedy Lamarr (1913–2000), who, with the help of George Antheil, developed a practical system for the US military during World War II. While modern spread-spectrum systems are electronically controlled, Lamarr's, which is illustrated below, was based on the mechanical, punched paper-tape technology originally used in player pianos. The sender and receiver each had identical machines with precisely synchronized electric motors that slowly pulled lengths of paper tape through them. The two tapes were punched with matching patterns of holes indicating which of 88 different radio frequencies the sender and receiver should use to communicate with each other at any particular time. As the tape chugged through the machines, communication switched from one frequency to another, in tandem, in a way that was completely unpredictable to outside observers. Since the radio transmissions were often extremely brief signals for steering torpedoes, it was quite likely that an enemy wouldn't pick them up at all or know what they meant even if they did. Artwork: Secret, spread-spectrum communication, as envisaged by Hedy Lamarr. I've colored and simplified it to make it easier to follow. A length of paper tape (blue) is punched with holes that encode a secret list of frequencies. A machine like a player-piano detector (red) reads the pattern of holes and sends corresponding electrical signals to a radio tuning system (green) that picks one of 88 possible frequencies on which to beam signals out to the receiver using a standard radio transmitter (orange). The receiver has similar equipment and switches to the same frequency at the same time. Artwork from US Patent 2,292,387: Secret communication system courtesy of US Patent and Trademark Office. 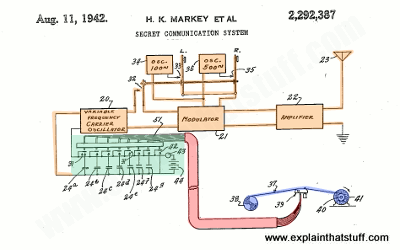 US Patent 2,292,387: Secret communication system by Hedy Kiesler Markey and George Antheil, 11 August 1942. Hedy Lamarr's original wartime spread-spectrum patent (Markey was her married name at the time the patent was filed). Wireless is always less secure than wired communication. Remember how old spy films used to show secret agents tapping into telephone wires to overhear people's conversations? Cracking wired communication is relatively difficult. Eavesdropping on wireless is obviously much easier because information is zapping back and forth through the open air. All you have to do is be in range of a wireless transmitter to pick up its signals. Wireless Internet networks are encrypted (use scrambled communications) to get around this problem. How secure is Bluetooth? Like Wi-Fi, communications are encrypted too and there are numerous other security features. You can restrict certain devices so they can talk only to certain other, trusted devices—for example, allowing your cellphone to be operated only by your Bluetooth hands-free headset and no-one else's. This is called device-level security. You can also restrict the things that different Bluetooth gadgets can do with other devices using what's called service-level security. Criminals get more sophisticated all the time; you've probably heard about bluebugging (people taking over your Bluetooth device without your knowledge), bluejacking (where people send messages to other people's devices, often for advertising purposes), and bluesnarfing (downloading information from someone else's device using a Bluetooth connection) and doubtless there are more ways of hacking into Bluetooth networks still to come. Generally, though, providing you take reasonable and sensible precautions if you use Bluetooth devices in public places, security shouldn't worry you too much. Is Bluetooth better or worse than Wi-Fi? People often get confused by Bluetooth and Wi-Fi because, at first sight, they seem to do similar things. In fact, they're very different. 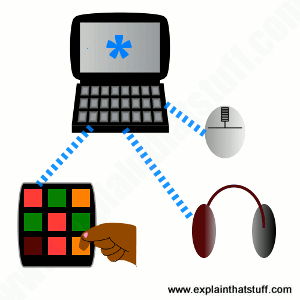 Bluetooth is mainly used for linking computers and electronic devices in an ad-hoc way over very short distances, often for only brief or occasional communication using relatively small amounts of data. It's relatively secure, uses little power, connects automatically, and in theory presents little or no health risk. Wi-Fi is designed to shuttle much larger amounts of data between computers and the Internet, often over much greater distances. It can involve more elaborate security and it generally uses much higher power, so arguably presents a slightly greater health risk if used for long periods. Bluetooth and Wi-Fi are complementary technologies, not rivals, and you can easily use both together to make your electronic gadgets work more conveniently for you! Bluetooth has often been quite tricky to use: like any wireless technology, it's another battery drainer for mobile devices; you can often step out of range, making communication erratic or impossible; and even getting two Bluetooth devices to talk to one another in the first place isn't always as simple as it should be. The world of mobile devices is changing as we move toward the so-called Internet of Things (where all kinds of everyday objects become net-connected)—and Bluetooth has to keep evolving to keep up. Recognizing the need to connect an increasing range of devices, more quickly, and more securely, Bluetooth's developers are regularly coming up with improved versions. First, there was Bluetooth BR/EDR (Basic Rate/Enhanced Data Rate, technically Bluetooth Version 2.1), offering simpler connectivity between devices and better security. Next came Bluetooth Highspeed (Bluetooth Version 3.0), which offered faster communication and lower power consumption. More recently, we've had Bluetooth Smart or Bluetooth Low Energy (technically referred to as Bluetooth Version 4.0+). As these names suggest, this version is better at connecting a wider range of simpler devices, uses much less power, and is much easier to integrate into mobile (iOS and Android) applications. Bluetooth: The official Bluetooth website contains information about Bluetooth products, technical guides, press coverage of Bluetooth, and more. Getting Started with Bluetooth Low Energy by Kevin Townsend, Carles Cufí, Akiba, Robert Davidson. O'Reilly, 2014. Bluetooth Operation and Use by Robert Morrow. McGraw-Hill, 2002. Bluetooth: Connect without Cables by Jennifer Bray and Charles Sturman. Prentice Hall PTR, 2001. Bluetooth Demystified by Nathan J. Muller. McGraw-Hill, 2001. The Internet of Things Will Need Better Ways to Locate Stuff by Michael Koziol. IEEE Spectrum, June 20, 2018. How better Bluetooth could help "things" locate themselves more precisely. Imec Boosts Bluetooth Battery Life by Katherine Bourzac. IEEE Spectrum, February 20, 2018. Engineers devise better circuitry for longer-lasting power. 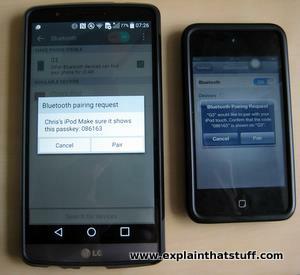 Bluetooth Smart Improvements Appear in More Devices by Molly Wood. The New York Times, October 29, 2014. Introducing Bluetooth Smart—and how it differs from "Bluetooth Classic." Using Bluetooth for recruitment: BBC News, 12 January 2010. How advertisers are using Bluetooth to recruit people for jobs. Testing Bluetooth's flexibility by Dan Simmons. BBC News, 26 October 2007. Summarizes the pros and cons of everyday Bluetooth use. Bluetooth is a registered trademark owned by Bluetooth SIG, Inc.